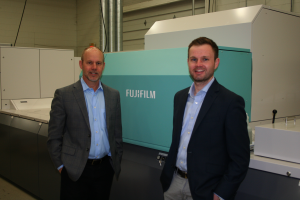 Color Ink, a Sussex, Wisconsin-based print services provider is changing its approach to traditional print while expanding into new markets with Fujifilm’s J Press 720S, a B2 size sheetfed production inkjet press. Jim Meissner, Todd’s father, started Color Ink in 1984, as primarily a commercial printer. With the addition of Austin Meissner, Todd’s son, Color Ink is now a third-generation family owned and operated business, with 100,000 square feet within two buildings situated on suburban Milwaukee land that was once a family farm. The operation includes 75 full-time employees, along with an additional head count of up to 50 temporary employees, working up to three shifts a day, five days a week. The Meissner’s research into an inkjet press that could fill their clients growing need for shorter runs and versioning culminated with a visit to Fujifilm’s Chicago Technology Center to experience the J Press 720S first-hand, including running a myriad of tests to prove that that the technology could meet their needs. Pictured, Todd Meissner, left, and Austin. “When we looked at other offerings before committing to the J Press 720S, we felt there wasn’t anything that was even close, in our opinion, to the cost of ownership, quality level, and uptime. With the quality we are seeing on Fujifilm’s J Press 720S, it’s better than litho; it’s revolutionary, and just a better way to print,” said Todd Meissner. With a 29.6-inch x 20.9 inch sheet and an output of 2,700 sheets per hour, Fujifilm’s second generation sheetfed J Press 720S was an ideal solution for printers like Color Ink because it offered the quality and robustness of an offset press, and the versatility to handle even the shortest of press runs. The configuration at Color Ink is capable of printing 100 lb. text weight to 18 point board stocks; while other configurations are available to run lighter weight stocks, as thin as 60 lb. text weight, and up to 24 point board stocks. Color consistency and tight project turnarounds are always on the minds of print service providers, and with the J Press 720S, they are essentially a non-issue. Printing on-demand and in shorter runs is a key element for Color Ink since more and more print buyers are specifying shorter runs and versioning. Click here to view the Color Ink J Press 720S ‘Owner Perspectives’ video. To learn more about Color Ink, please visit: www.ColorInk.com.